There are so many stages to a craft project… dreaming, planning, starting, in progress, finishing touches and for me, photography & blogging. Any given project can stall in one of the stages for a week, a few months or even years in some cases. It’s probably not a good idea for me to compile a list of all the projects that I have in these various states of completion, I imagine it would amount to 50+ projects, at least. I try to look at it as having variety, so that when I’m in the mood for something and inspired there will always be ‘just the thing’ for me to work on. 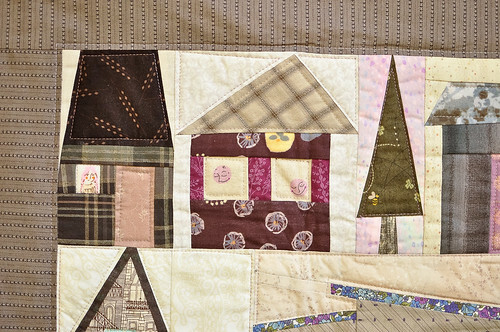 I started this awesome Houses pattern last year in our Machine Foundation Paper Piecing class. You can see my progress posts here and here. The quilt top came together during the class , but I didn’t end up basting and quilting it until the end of the year. Finally about six weeks ago, I pulled it out and took it into the back yard for a photo shoot. It’s my first wall hanging project and I’m pretty sure it’s going to be living on a wall at the workroom. Machine Paper Foundation piecing is a pretty AWESOME technique. The method that Johanna teaches is wonderful and does not require you to sew through the foundation paper. The joy of this is that you don’t need to spend time at the end ripping bits of paper out of the back of your project. 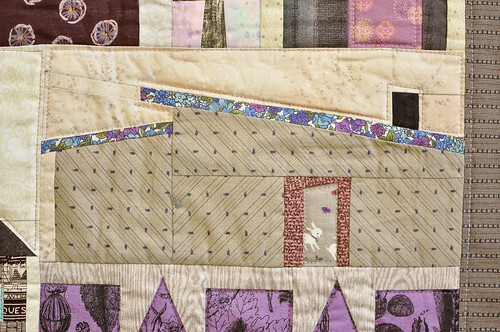 Paper piecing allows you to create shapes and designs that would be really difficult/impossible to patchwork otherwise. Last week, I made a pieced ‘M’ block, using this technique. It was pretty easy to just draft it out and then piece my design together. So fun! Next up, I want to try some of the designs from Yoko Saito’s book. Many of you will be very happy to know that our quilt master, Johanna Masko is busy working away on a line of patterns of all her quilty goodness. For those of you who can’t join us at the workroom in Toronto for her classes, you will be able to purchase her designs online. YAY! 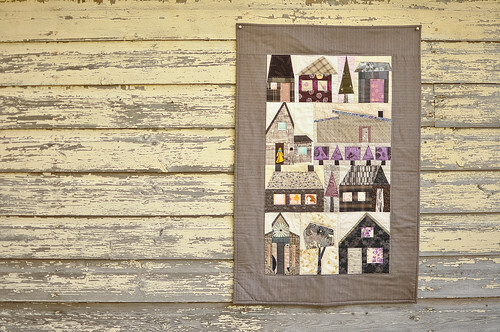 Houses is the first release of her pattern line with several more to follow in the next few months! They will all be available in our online shop as they are released. 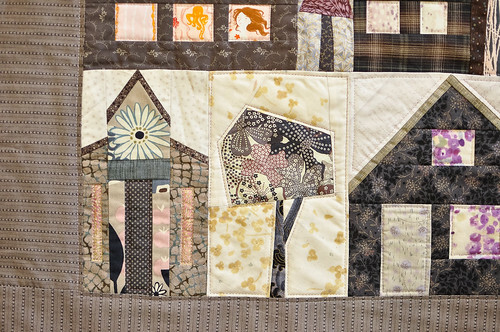 For more paper piecing inspiration, take a look at this little gallery that I made on flickr. This is so pretty. 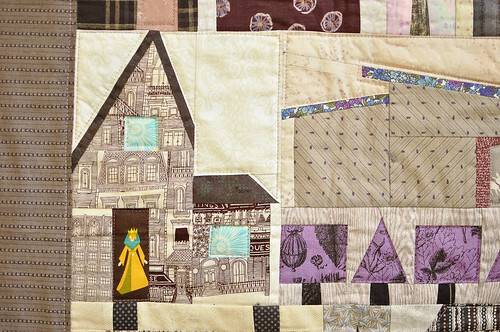 The one tiny castle peep in the doorway…that fabric was such an inspiration for me, it’s one of my favourite prints of all time! this is so pretty – i’d like to try this idea sometime (i’m not sure if i have 50 different pieces on the go right now, but i certainly have at least that many in the dreaming stage). I love this so so much. So beautiful. I’m looking at it on my phone and can’t wait until I get onto my computer to see it big! Love all the details and the faces, people in windows, and the trees are just wonderful. This is going to look so good on your shop wall. I only wish I could come see it in person (live on the other side of the world!). Your blog and making is so inspiring. it is truly amazing!!! i love how you put it all together, so beautiful. Love how yours turned out!! It was a great class – I think my favorite. I so need to get on the popscicle ones that you have in your flickr group. Still working on mine, your colour pallet is delightfully misty, ethereal. I was a faithful reader of your blog for a long time, but stopped reading recently as I figured you were (sadly) done with blogging. And then tonight, I checked it on a whim and come to find that you just ended a one-month stay in my town! Looks like a missed you my just a few weeks. I would have loved to direct you to some of my favorite places. It seems like you found a lot of the treasures here all by yourself though. Glad you’re all safely back home. Come again sometime! yay!! 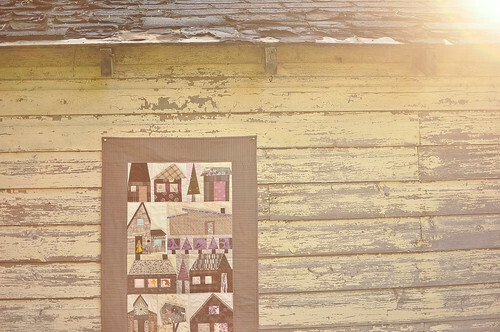 so excited to hear that i’ll be able to purchase a pattern for this wallhanging that i’ve loved since i first saw it!